Obama has ramped up use of Predator drone strikes. In this week’s Newsweek, Tara McKelvey talks exclusively to the man who signed the death warrants. • The number of such killings, carried out mostly by Predators in Pakistan, has increased dramatically during the Obama administration, and these covert actions have become an integral part of U.S. counterterrorism strategy. • In the first report on the formal process of determining who should be targeted by drones, Tara McKelvey interviews former CIA acting general counsel John A. Rizzo, who was heavily involved with President Bush’s program of enhanced interrogations in the so-called black sites, or secret prisons, around the world. • The president does not review the individual names of people to be targeted; Rizzo said he was the one who signed off and that operations are planned in advance in a legalistic fashion. • There is probably no official CIA roster of those who are slated to die. • The hub of activity for the targeted killings is the CIA’s Counterterrorist centre, where lawyers—there are roughly 10 of them, says Rizzo—write a cable asserting that an individual poses a grave threat to the United States. Then the general counsel must approve the operation. • The military and the CIA often pursue the same targets, like Osama bin Laden, but handle different regions of the world. Sometimes they team up, or even exchange jobs. It was an ordinary-looking room located in an office building in Northern Virginia. The place was filled with computer monitors, keyboards, and maps. Someone sat at a desk with his hand on a joystick. John A. Rizzo, who was serving as the CIA’s acting general counsel, hovered nearby, along with other people from the agency. Together they watched images on a screen that showed a man and his family travelling down a road thousands of miles away. The vehicle slowed down, and the man climbed out. The broad outlines of the CIA’s operations to kill suspected terrorists have been known to the public for some time—including how the U.S. kills Qaeda and Taliban militants by drone aircraft in Pakistan. But the formal process of determining who should be hunted down and “blown to bits,” as Rizzo puts it, has not been previously reported. A look at the bureaucracy behind the operations reveals that it is multilayered and methodical, run by a corps of civil servants who carry out their duties in a professional manner. Still, the fact that Rizzo was involved in “murder,” as he sometimes puts it, and that operations are planned in advance in a legalistic fashion, raises questions. The number of such killings, carried out mostly by Predators in Pakistan, has increased dramatically during the Obama administration, and these covert actions have become an integral part of U.S. counterterrorism strategy. How CIA staffers determine whether to target someone for lethal operations is a relatively straightforward, and yet largely unknown, story. The president does not review the individual names of people; Rizzo explains that he was the one who signed off. People in Washington talk about a “target list,” as former undersecretary of state Richard Armitage described the process at a recent event in Washington. In truth, there is probably no official CIA roster of those who are slated to die. “I never saw a list,” says a State Department official who has been involved in discussions about lethal operations, speaking without attribution because of the nature of the subject. Officials at the CIA select targets for “neutralization,” he explains. “There were individuals we were searching for, and we thought, it’s better now to neutralize that threat,” he says. A Los Angeles Times article once described John Rizzo as “the most influential career lawyer in CIA history,” and he arguably knows more than anyone else in the government about the legal aspects of the CIA’s targeted killings. But he stumbled into the world of espionage almost by accident. He graduated from George Washington University Law School and was living in D.C. in the 1970s when the Church Committee released its report on the CIA’s attempts to assassinate foreign leaders. Rizzo sensed an opportunity: “With all that going on, they’d need lawyers.” He got a CIA job soon afterward. Decades later, as the CIA’s interrogations and lethal operations were ramped up after 9/11, Rizzo found himself at the centre of controversy. He was, as he puts it, “up to my eyeballs” in President Bush’s program of enhanced interrogations in the so-called black sites, or secret prisons, located in Afghanistan and in other countries. Justice Department lawyer John C. Yoo wrote the infamous “torture memo” of August 2002 because Rizzo had asked for clarification about techniques that could be used on detainees. Rizzo had once hoped to become the CIA’s general counsel, but members of the Senate intelligence committee balked because of the role he played in authorizing the interrogations. Rizzo retired in 2009. Today, Rizzo can sometimes sound boastful. “How many law professors have signed off on a death warrant?” he asks. He is quick to emphasise that the groundwork was prepared in a judicious manner, and felt it important that he observe the killing of some of the high-level terrorism suspects via live footage shown in CIA offices. “I was concerned that it be done in the cleanest possible way,” he explains. Clean, but always morally complex. Rizzo would sometimes find himself sitting in his office on the seventh floor of the CIA building with a cable about a terrorism suspect in front of him, and he would wonder how his Irish-Italian parents would feel about his newly assigned duties. Under another Bush order, signed several years later, a variety of people who worked in terrorist camps could be targeted, and not just named terrorism suspects; at that point, the pool of potential candidates reviewed by CIA lawyers became much larger. Despite the secrecy surrounding these orders, their scope has become clear. “The authority given in these presidential findings is surely the most sweeping and most lethal since the founding of the CIA,” William C. Banks, director of Syracuse University’s Institute for National Security and Counterterrorism, told a House committee. Sometimes, as Rizzo recalls, the evidence against an individual would be thin, and high-level lawyers would tell their subordinates, “You guys did not make a case.” “Sometimes the justification would be that the person was thought to be at a meeting,” Rizzo explains. “It was too squishy.” The memo would get kicked back downstairs. The cables that were “ready for prime time,” as Rizzo puts it, concluded with the following words: “Therefore we request approval for targeting for lethal operation.” There was a space provided for the signature of the general counsel, along with the word “concurred.” Rizzo says he saw about one cable each month, and at any given time there were roughly 30 individuals who were targeted. Many of them ended up dead, but not all: “No. 1 and No. 2 on the hit parade are still out there,” Rizzo says, referring to “you-know-who and [Ayman al-] Zawahiri,” a top Qaeda leader. As administration critics have pointed out, government officials have to go through a more extensive process in order to obtain permission to wiretap someone in this country than to make someone the target of a lethal operation overseas. The detainees, by and large, survived, Rizzo observes; today, high-level terrorism suspects often do not. And for all the bureaucratic review, it’s not always precise in the real world. In December, people took to the streets of Islamabad to protest the strikes and to show support for a Waziristan resident, Karim Khan, whose son and brother were killed in a strike in 2009 and has filed a lawsuit against the U.S., charging a CIA official for their deaths. Administration officials insist that the targeted killings rest on a solid legal foundation, but many scholars disagree. 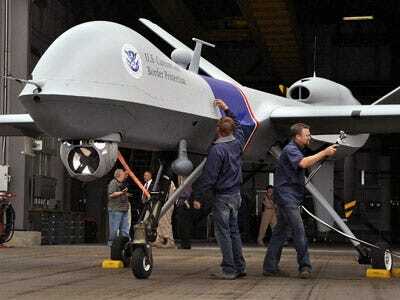 Georgetown University’s Gary Solis, the author of The Law of Armed Conflict, says people at the CIA who pilot unmanned aerial vehicles are civilians directly engaged in hostilities, an act that makes them “unlawful combatants” and possibly subject to prosecution. These days, Rizzo is working on a memoir. He does not talk about the morality of what he did—he is not that kind of guy—but lately has been trying to come to terms with the implications of the deadly task he performed, and which others are now performing in that office building in Virginia. Tara McKelvey, a frequent contributor to The New York Times Book Review, is the author of Monstering: Inside America’s Policy of Secret Interrogations and Torture in the Terror War (Basic Books).